Please us as we stand in Solidarity with Tibet on the occasion of Human Rights Day, on December 10, 2012. Everyone around the world can attend this virtual event, so invite your friends. 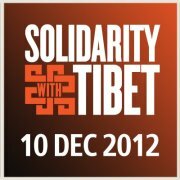 (1) Update your profile picture on Facebook to the "Solidarity with Tibet 10 DEC 2012" image, which you can find below. (2) Post a status on Facebook containing the words “Solidarity with Tibet” and set the location of your status to Lhasa, Tibet: Potala Palace, Lhasa. (3) Join Thunderclap! Solidarity with Tibet have partnered with Thunderclap, so their message can be heard loud and clear around the world on 10 December 2012 (Human Rights Day). Please support Thunderclap with your Facebook and/or Twitter account(s), and they will all share a synchronized message of #SolidarityWithTibet on 10 Dec. Help us reach our goal of 500 supporters by signing up now at https://www.thunderclap.it/projects/758-stand-in-solidarity-with-tibet.